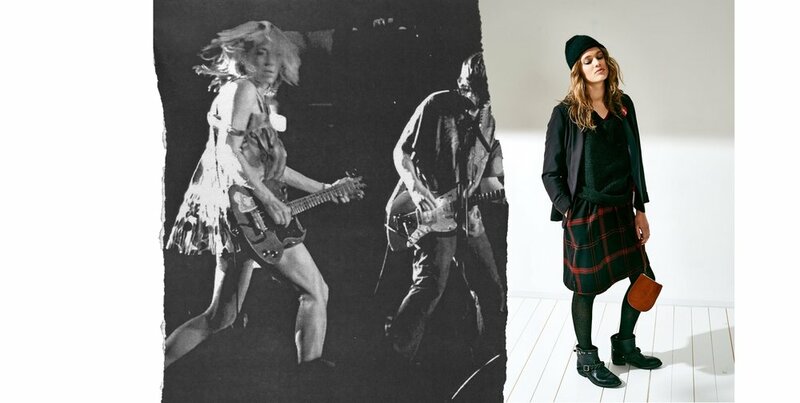 Our latest campaign was inspired by seminal 90s rock band Sonic Youth, and by the group’s charismatic frontwoman Kim Gordon in particular. Her signature androgynous looks and outfits established her as a true style icon and her personality embodies the vision we have for Bellerose as a brand. Discover the campaign and listen to our newest playlist below. Few bands have shaped the history of rock music as much as Sonic Youth. Revolving around iconic couple Thurston Moore and Kim Gordon, the New York City group successfully managed to create a bridge between their home city’s DIY punk underground scene and a more mainstream rock audience, all while never compromising their distinctive sound. An outspoken feminist, Kim Gordon was—and still is—a true girl power icon. Using the bass as her armor, she spent her career inspiring women everywhere and proving that she had every right in the world to be on stage, fronting a rock band. Refusing to play the game of having to dress in a way that would primarily please the male audience, she wrote her own rules and crafted her own aesthetic, one that was primarily driven by her wish to dress for herself. Her oversized, layered silhouettes relying on leather, tartan and denim are the inspiration behind this new campaign we are excited to share with you. To set the mood, our team has also prepared a playlist filled with legendary artists from the American alternative rock scene of the 80s and 90s. Think Pixies, Nirvana, Television and, of course, Sonic Youth. Ready to rock? Just press play below!